Many Manufacturing Enterprises are willing to undergo the "lean" road. Many enterprises make a formal decision in this respect. However, many enterprises just don't get there: their "lean" project gets somehow stuck midway and even at the very beginning - momentum decays or even gets lost altogether - the "lean" project gets postponed, delayed and even rescheduled indefinitely. Why? Because either the direction, the "lean" direction is not clear - or, even when it's rather clear, they cannot set priorities and produce a formal, comprehensive plan of action. People gets confused on priorities: what comes first, second and third is vague or blurred - and all constraints associated with a lean initiative are not properly identified and understood. Episodes like the above happen very frequently: what lacks is a central "lean" plan, a comprehensive plan that links ALL necessary lean initiatives, highlighting all constraints and setting all necessary priorities. This is where Value Stream Management and its operational arm, Value Stream Mapping, come to the rescue. Descending from Value Adding Management (more ») and Process Engineering (more »), Value Stream Management (VSM) is a discipline for planning, linking, integrating and co-ordinating "lean" initiatives. This is done operationally by deploying the Value Stream Mapping technique, that calls for systematic data collection and analysis. Manufacturing lead-time (throughput time) reduction through waste elimination. Understanding/analysing Flow of Materials and Flow of Information along the selected Value Stream/s. To become effective, VSM must be understood, supported and driven by Top Management - and understood/known operationally by Managers, Supervisors, Team Leaders and key frontline personnel. Besides representing a fantastic tool for the operations/improvement groups - who need practical techniques for understanding their operational system and for planning/prioritising lean initiatives - VSM is also a super tool for Top Management, who need to know and "touch" the benefits associated with a lean project. The common tool for both is the Value Stream Mapping "storyboard", a poster size framework holding all key data for planning lean initiatives. This the most critical and delicate step in the path to "lean". Enterprise's Top Management must be fully knowledgeable and fully committed to lean. It's the usual "big-bang", without which nothing will happen: if Top Management delegates the lean project and leaves it in the hand of a senior manager (possibly the Operations or Production Manager), it is likely that the project will end up into marginal and even spurious improvement. If the above requirements are not verified, the lean projects limbs and sooner or later will show its deficiencies. To the purpose, Top Management must undergo formal Lean Manufacturing and Value Stream Management training. In this regard, all the times I am asked to deliver in-house Lean Manufacturing training courses I set a pre-requisite and insist that Top Management will be attending full-time. Finito. Generally, a well convinced and committed Top Management will make, sooner or later (the sooner the better), a simple but very loud declaration to all people in the enterprise. This generally includes a formal announcement that the enterprise is now going into the lean direction - that everybody in the enterprise will be formally trained in the use of lean tools and made aware of the lean benefits, constraints and implications - that everybody in the enterprise will be requested to participate actively in the lean project - that everybody is most welcome to remain on board the boat now going lean, and to contribute to row in the desired direction - that this, however, is not compulsory: it is well possible that someone will not like the "lean philosophy"; in which case those "someone" will not be compelled to remain on board - but must be well clear that the direction is now set, it is irrevocable and definite: there is no come back. Another critical move during this initial step is the appointment of a Lean Project Manager (LPM). Top Management must identify one senior manager who will be in full charge of the Lean Project, fully responsible for it, and fully accountable to Top Management in its regard. It is important to point out that this is not a simple delegation: the appointed LPM will report regularly to Top Management in strict liaison and Top Management will always be the driver of the Lean Project. However it is essential to appoint such person, as the complexity of a Value Stream Mapping exercise must be dealt with and well co-ordinated by a person with all typical features of a Project Manager: good thinker, good planner, good communicator, good team leader, good co-ordinator, good administrator, etc. Who should such person be? A senior manager, with considerable authority, and not necessarily from Production or Operations. The lean PM may well be one director of the enterprise or a member of Top Management. What is essential is that the person has good Project Management knowledge and abilities. That's all. During this initial step, the Lean Project Manager (LPM) will also appoint his "primary" VSM Team, comprising members from all main functional areas (Production, Quality, Maintenance, Engineering, Procurement.....). Now things are ripe for step 2. An enterprise may manufacture one product only, or several products, or a range of similar products, or some or many ranges of products. A value stream is defined as that sequence of processing activities that produce as an output a product or range of products (or service/s, or both). A value stream is a process, the entire process required to produce a product or range of products, including all its processing stations, manufacturing lines, etc. It begins in the incoming raw materials area, and ends at the product/s despatching area. However, under the VSM angle of view, a value stream begins at supplier's premises and ends at client/s' premises. An operational, manufacturing process may be not value-streaming at all, i.e. it might be so "traditional" (batch/push) and so full of waste that it flows very little or even doesn't flow at all like a stream should. It is the task of the VSM exercise to make it flowing and value-generating, e.g. "lean". One of the primary tasks of the VSM Team, co-ordinated by the LPM is to select one or more value streams on which the VSM technique will be deployed. It depends by the policy set by Top Management - by practical constraints - by common sense. In a SME it may be rather easy to deploy a VSM exercise over the entire range of value streams. In a larger and more complex enterprise it may be impossible, or un-justified, or excessive. Considering the difficulties and required energies/resources associated with a VSM exercise, either the VSM Team, or Top Management, or both may decide to rationalise things and focus initially only on one or few value streams, possibly those related to the most popular/fast selling products or range of products, and leave other value streams for a future time. The selection of one or more value streams is critical, as a VSM exercise MUST be a successful exercise: no failure is possible, or the Lean Project may suffer indefinitely. Once value stream/s are selected, the VSM Team can start planning the subsequent step/s. This includes: identifying all personnel related/associated to the selected value stream/s - grouping/structuring them in a number of sub-teams, all co-ordinated by sub-LPMs - planning adequate Lean Manufacturing training for all of them. A VSM exercise will succeed only if those concerned in each operational area of the value stream will fully participate in the VSM exercise (bottom-up, but top-driven/co-ordinated) and will get actively involved and committed. This means all concerned personnel will have to be exposed to Lean practices - gradually buy-in the lean concept - and gradually shift culturally from traditional mentalities to a leaner way of thinking. This requires gradualism, although deploying Lean practices actually create higher involvement and contribute rather fast to the necessary cultural change. Planning adequately this part of the VSM approach can definitely be rather delicate in many "traditional" enterprises. This is the education and training stage, both formal and informal training. A well planned Lean training program will include: awareness generation/sensitisation to identification/elimination of waste - a rather comprehensive presentation of lean benefits, limitations, constraints and implications - an initial, broad presentation of the available lean disciplines and their areas of deployment - illustration of practical VSM procedures and tools - tips on how to generate and maintain the "lean momentum". A train-the-trainers program should also be included, so that formal and on-the-job training can regularly take place in a top-down style over the planned period of time (and subsequently, indefinitely.....). ALL THOSE CONCERNED, at all levels. Finito. Timing: not forgetting that the factory cannot stop its operations, adequate time should be allowed for the learning process to take place and penetrate sufficiently. No fixed rule can however be set. The subsequent step may start either at the end of this phase, or even before (while the education/training process still goes on). As stated before, the main VSM tool is the so-called storyboard. Normally, at the bottom of the poster, there is an area reserved for "metrics" (current and future metrics - see below). There are a preliminary step and a number of operational steps to map the current state. Round-the-table Team work. The LPM re-defines the Project - highlights the reasons for selecting the chosen value stream/s - re-explains briefly the VSM approach/procedures - re-defines the operational Teams appointed for the task - sets time-frames - and assigns duties to the co-ordinators (sub-PM) of the operational Teams. Map the Process (Arrow Diagram tool). This step, generally, is not included in typical VSM exercises. I strongly recommend it (see reasons below). It consists in identifying all Processing Components (both Value-adding AND non-Value-adding) in the selected value stream process and map the process to scale - all physical constraints (pillars, walls, etc.) as well as any difference of floor level must be indicated. Please note: no physical constraints (pillars, walls, etc.) are shown in the above diagram (for simplicity). Note: attached to each Processing Station icon there is a data box (which must then be filled with data). A similar one is drawn next to Supplier and Client icons. Also a data box regarding the entire process is positioned in the Current State area. The schematic diagram drawn represents the Flow of Materials for that Value Stream. Now the Data Collection step may begin. The first stage consists in collecting data regarding the Flow of Materials. Operations must be documented with relevant data. Which data? - QC on acceptance specs. As integral part of this step, also data regarding the "what happens between Processing Stations" and "between Supplier/s and Processing Station 1" and "between last Processing Station and Client/s" must be collected and documented. - Method of transmission of materials between: Supplier/s and Processing Station 1 - between the various Processing Stations - between Last Processing Station and Client/s. This may be: a PUSH method - a PULL method - a hybrid method. Also the total Days of Inventory/WIP on hand should be calculated and entered in the Process Data Box. Times may be expressed in hours, days or weeks, as the case may be. It's now time to start investigating the Flow of Information in the Current State, the second stage of Data Collection. The VSM Team/s must therefore investigate thoroughly the mechanism above, extracting significant data out of it, and document it schematically in the Current State Map. Please note the various data boxes positioned: next to Central Processing (Central Processing Unit data) - between Client/s and Central Processing Unit (Client/s orders placing data) - between Central Processing Unit and Supplier/s (orders to Supplier/s placing data) - between Central Processing Unit and Production Planning/Control (data regarding transmissions of Production Orders to Production Planning) - next to Production Planning/Control (data regarding this Unit) - between Production Planning/Control and Processing Stations (via Production Supervision if applicable) (data regarding transmission of Production Plans and Schedules to Processing Stations). Which are the significant data to be collected and documented? Know in sufficient details and with sufficient clarity how the information mechanism works, so that all concerned entities (Suppliers and Processing Stations) know what to do, when to do it, and how. The Data Collection step is the most delicate and at the same time the most energy-consuming part of the VSM exercise. Yet it is vital not only to draw the Current State Map, but primarily to enable all those concerned to know (finally!) how the Current System of Operation works! It demands the involvement of several VSM Teams and may require long time to be completed accurately. It is extremely important to collect and document only significant data, but ALL significant data (those that may impact the design of the future, lean state) must be collected and documented. While the collected data start flocking into the VSM Control Room (where the storyboard is located), they are verified and then inserted in the relevant data boxes. Eventually also this step is completed. The Current State Map is checked and verified in great detail, and gets finally approved by the LPM. The Current State Map just produced is an excellent, operational tool to understand and analyse in detail the present state of affairs (the Future State Map will have a similar purpose). Therefore it is a vital tool for the VSM Teams, a tool that enables their members to trace important operational details at any time they may be required. However, in order to compare (eventually) the present state of affairs with a proposed, future, leaner one, details are not so important, especially for Top Management. What is required is indices: few, global and meaningful. That's why this step becomes so important. During this step of the VSM exercise, the primary VSM Team (the one lead directly by the LPM) identifies and defines the system metrics, synthetic indices describing broadly but effectively the system "performance". They are sufficient to assess the System Performance (actually, the main "lean" index alone gives already a rather good indication of the System Performance). However, it is up to the primary VSM Team to identify the necessary System Metrics, agree upon them, and document them in the pertinent area (the lower area of the VS Map). Now the power of the VSM exercise starts appearing: once the Future State will be mapped and the corresponding, proposed metrics will be identified, it will be possible to compare thoroughly the 2 states, and assess the improvements that will be achieved if the Future State plan will be implemented! Produce a proposed, Future State Map that will be "leaner" than the present one (as lean as possible), bringing up a number of Kaizen-style Improvement Projects suited to the circumstance. NB: Targets must be realistic BUT challenging - and, there must be "universal" consensus on the targets finally set. Insert Data boxes for subsequent use. - What is the TAKT TIME? - Are you over-producing, under-producing or meeting the demand? - Can you meet the TAKT TIME (or the OPERATIONAL TAKT TIME, or the PITCH) with the current Production Capacity/facilities? - Do you need BUFFER STOCK? Where? How much? - Do you need SAFETY STOCK? Where? How much? - Will you need a FINISHED GOODS SUPERMARKET? - And what LEAN IMPROVEMENTS will you need to improve your ability to meet the required TAKT TIME? Do not go into micro-details of the "future" state at this stage - this will come later. Start thinking of which basic "Lean" Disciplines/Techniques you are going to adopt at "which" Processing Stations. These may include, for instance: SOCO (more ») - AQCO (more ») - Autonomous Maintenance and other TPM (more ») tools. The deployment of the above Disciplines (or others) may have resulted obvious and necessary when producing the Current State Map. So this is an essential item to be considered. Determine which Quality Improvement Technique/s you are going to adopt for improving drastically the output quality of critical Processing Stations. For instance: TQM (more ») techniques - "in-process" Quality Control/Assurance performed by Operators - SPC - 6 Sigma (more ») - 0 defects/Poka Yoke tools (more ») - 100% Quality Testing - etc. The deployment of the above Techniques (or others) may have resulted obvious and necessary when producing the Current State Map. So this is an essential item to be considered. - Where can you apply "continuous flow"? - Can you go for "one-piece flow" in a number of adjacent Processing Stations? - Can you reduce considerably the "lot size" in a number of adjacent Processing Stations? 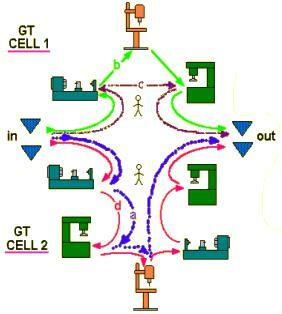 - Can you introduce U-Cells (more ») to replace a number of adjacent Processing Stations? - Can you bring closer and join together two or more adjacent Processing Stations? - Can you integrate any multi-process Station/Line? - Can you eliminate altogether (any) redundant Processing Stations? - Can you apply "Process Razing" and "Group Technology" techniques to group together a number of adjacent Processing Stations? This is where the previously drawn Process Map (using the Arrow Diagram tool) comes handy. Note: if machines belonging to the same category (i.e. 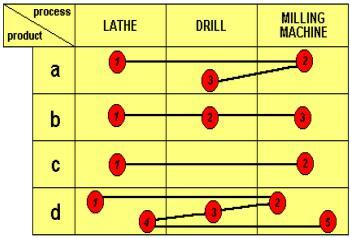 Lathes) differ (in size, capacity, speed, features....), then a separate column should be made for each machine. Brainstorming: Is there any physical constraint or limitation imposed by the factory layout (refer to Process Mapping)? On the other hand, is there any hidden opportunity arising from the factory layout that can be exploited? With regard to opportunities: gravity is a fantastic allied in manufacturing. This force is readily available everywhere, is abundant and free-of-charge. Where and how can the force of gravity be used in the future state, f.i. to convey materials/workpieces from one Processing Station to the next, thus establishing continuous flow? Brainstorming: How will you then control upstream production: KANBAN (more ») - pure PULL/FLOW - IN-PROCESS SUPERMARKETS - or traditional MRP? Answers must be given. The real challenge is to try to go for pure PULL/FLOW all along the future value stream, if at all possible. Carefully study the "future state" Line Balancing. LINE BALANCING is the method by which work elements for that product/range of products are evenly distributed at each Processing Station all along the entire Manufacturing Process in order to meet TAKT TIME. - The number of operators required at and between Processing Stations needs to be assessed realistically - the overall Operators' work must be balanced and synchronised. NB: Do not attempt to study the "future" flow of information at this stage - only focus on flow of materials. Draw, in subsequent, experimental steps the future state map. Continuous brainstorming/debating may be required. - Processing Stations that are going to be eliminated (such as "external" QC stations) do not need to be displayed. Draw, next to each "future" Processing Station, the lean improvement method needed to actually implement it (such as AQCO - TPM - Cell - etc.) using the "cloud" icon or any icon of your choice. Attach to each "future" Processing Station the respective Data Box showing the new, significant Attributes as extrapolated by the Team/s (Cycle Time - Available Time - Overall Uptime - Change-Over Time - OEE - Operators' icons - etc.). Think of how you are going to set PRODUCTION LEVELLING [over a day or a shift: even distribution of work-load required to meet customer demand within the various Processing Station so that no one will fall behind (overloaded) and no one will be under-utilised (idling)]: Continuous Flow? Kanban? Paced Withdrawal? Heijunka Box system? Draw the Flow of Information (electronic and manual): to/from Customer/Supplier - to/from Production Planning/Control from/to Processing Stations (include Production Supervisors' boxes in between as required). In a much leaner and pull system, such as the one in the example, the Flow of Information between the Planning/Control Unit and the Processing Stations becomes extremely simple: information on orders to be produced are transmitted to the most downstream Station (4/5/6 in the example) and simultaneously to the others. The entire system then gets into motion in a pull style, and the continuous flow gets established. In this exercise also the entire Planning/Control Unit may get totally "re-engineered" to suit the new system, as well as the Central Processing Unit. In a "lean" system no functional area remains untouched! For simplicity, no Flow of Information lines are drawn in the example scheme. Review the Future State Map - touch-up, perfect as necessary - enter the final version in the storyboard. For each "Metrics" parameter in the "Current State Map", define/calculate the corresponding one for the "Future State Map", and enter in the storyboard. Compare. After the final review of the "Future State Map", the real Improvement stage begins. Kaizen projects, fit to implement to proposed "Future State" Map, must now be generated. This is where the VSM exercise produces the most valuable results: because the VSM Teams now have on hand all what is required to get to the Future State system. All data are available. The systems (present and future) are no mystery. The "direction" (the lean direction) is clear. All is clear. The target is appealing and challenging at the same time. The complete list of "things-to-be-done" is rather easy to produce. The thinking power released during the previous steps has done the trick. Technical issues (training issues, layout issues, etc.) - organisational issues - physical issues (physical layout constraints to overcome as well as opportunities to be exploited, machinery to be moved, etc.) - all have already been debated before and during approval of the Future State Map. 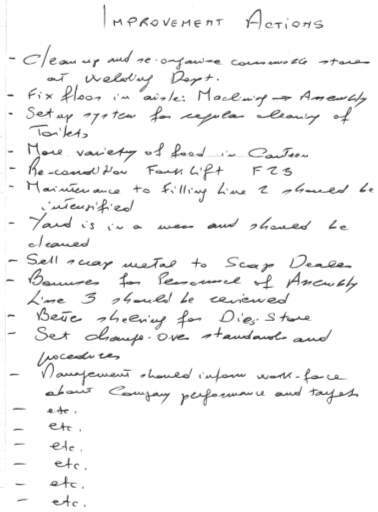 That improvement list can easily be produced. A bit more complex is prioritising activities and establishing their logical sequence, as well as estimating durations and cost impact of the improvement activities that need to be carried out. Whereas the "who-is-going-to-be-in-charge-of-what" is not too difficult to identify, as all Team/s members by now know each other very well and have assessed their respective abilities and competencies. More thinking will be necessary, but eventually a "Lean Master Plan" can be produced. Wow, what a beauty! All what is to be done, when, for how long, in what sequence, lead by whom, costing how much, etc. etc. All is there! The Lean Master Plan is a true Kaizen Plan and works wonders! Also the Lean Master Plan, once reviewed and approved, gets posted next to the Storyboard. There is a final job for the VSM Primary Team: the plan of the future is ready, but to become operational must also please Top Management, isn't it? So, benefits can be established somehow. The total expenditure associated with the Future State Lean Plan comes out of the Lean Master Plan: a good Plan caters for estimates of ALL costs associated with the required Improvement Projects (including cost of training - cost of new equipment/ancillaries/accessories as well as jigs, tools, etc. - cost of physical layout changes and machinery relocation - cost of new services and logistics - etc.). So, Top Management now has: total cost and total benefits. What is the resulting ROI? Good project planning is the secret of a good project. If the VSM Team/s have worked well, implementation should be rather smooth. Question: what is the typical implementation time frame for a Lean Plan? There is no typical time frame: for simple situations (like in the SME), that might be just a few months. For more complex situations, it may get to 1,5 - 2 - 3 and even 5 years. Even after achieving perfectly-lean value streams (utopia), the lean fanaticism may extend side-ways. Where to? How much waste hides there? Lean Thinking (more ») goes far beyond the operations border and tackles the entire enterprise, using actually tools like VSM and others. Co-ordinated by the LPM, the control function takes place all along the Implementation phase: to identify discrepancies and deviations from the master plan - to rectify - generally to assure compliance to the time frame, the budgeted costs, the goodness of the result. Top Management must be kept informed at all times and should be officially notified of every milestone that has been completed. Value Stream Mapping is generally a hard, time and resource consuming exercise. However, to date, it is the best integration and co-ordination tool for lean initiatives ever invented. Besides Manufacturing Operations, it can be deployed for any industrial and commercial type of operations and activities: from Construction to Import/Export, from Healthcare to Retailing. There is no simple shortcut. But, in simpler situations, there are other Lean Thinking (more ») tools that can be deployed, for instance a Spaghetti Diagram (very powerful tool).